Over 80 attendees turned out to celebrate the Best of Region IV at the Sofitel O’Hare in Chicago on January 18. Hosted by the Chicago NAMA Chapter, the event honored the best work of the Chicago, Mid-America, Heartland and Badger Chapters. The region had 168 entries and the regional judging was held in Kansas City in November. Colleen Callahan with Colleen Callahan Communications volunteered her time as emcee and kept the event rolling along. All first and merit winners are eligible to advance to the national competition. Winners will be notified by February 1 on how to advance their entries. 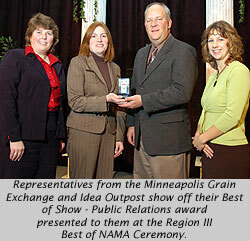 For a list of all Regional Best of NAMA Winners visit, http://www.nama.org/amc/regional.htm. Due to scheduling conflicts, the Eastern/Chesapeake chapters were unable to gather enough members for this year’s Region VI Best of NAMA Awards Ceremony. As a result, we are cancelling the lunch ceremony that was to take place in Trenton, NJ on Jan. 26th. So that members can enjoy the best networking experience possible, we try to bring together a large group when we organize regional NAMA events. We’ll try again for an earlier ceremony date in January 2008. Congratulations to our winners and good luck to entries that are advancing to Best of NAMA! The deadline for submitting nominations for the Agribusiness Leader and NAMA Marketer of the Year awards is this Friday, January 19. NAMA is looking for individuals who are outstanding leaders in agribusiness, education, government service or other agribusiness related areas as well as individuals with outstanding accomplishments in the field of marketing directly to ag producers for the Agribusiness Leader of the Year and NAMA Marketer of the Year awards. The Agribusiness Leader of the Year award is NAMA’s highest honor. Solicited from senior level position holders in private, public or academic service, nominees should exemplify excellence in agribusiness by their significant contributions to the industry. Nominees need not be NAMA members. NAMA recognizes its active members with senior management of marketing and/or sales responsibilities with the NAMA Marketer of the Year award. This award is the most prestigious honor awarded to an active member of the association and honors outstanding accomplishments in the field of agri-marketing. Nominees must be NAMA members. For more information about the Agribusiness Leader and NAMA Marketer of the Year awards visit, http://www.nama.org/awards/awards-index.html. 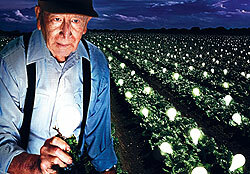 To nominate someone now for the Agribusiness Leader of the Year award visit, http://www.nama.org/awards/agribusinessform.htm. To nominate someone now for the NAMA Marketer of the Year award visit, http://www.nama.org/awards/namamarketerform.htm. Region VI will be hosting a Best of NAMA awards luncheon on Friday, January 26 in Trenton, New Jersey. Winners of the regional Best of NAMA awards in the advertising and public relations categories will be announced. Enjoy an afternoon with other agri-marketing professionals and make new contacts. All NAMA members, colleagues and friends are welcome to attend. The luncheon will begin at 12:30 p.m. at John Henry Seafood on the corner of Washington and Mifflin Streets in Trenton. Cost for the event is $45 per person. Please RSVP by January 22 to Catherine Wang, cwang@gibbs-soell.com, 212-697-2600 ext. 202 or Matt Coniglio, mconiglio@fastline.com. Please RSVP only if you are sure of your attendance. For more information visit, http://www.nama.org/amc/bon/region6.htm. Don’t miss out on other Best of NAMA events! The Carolinas/Virginia NAMA chapter ceremony will take place at the North Carolina State Fairgrounds in the new Martin Building. For more information and how to register for the event visit, www.nama.org/amc/bon/carvir.html. The Midsouth NAMA chapter ceremony will take place at the Tower Room American Grille in Memphis, TN. Cocktails will kickoff the event at 7:00 p.m.
For more information and how to register visit, www.nama.org/amc/bon/midsouth.html. This ceremony will take place at the Sofitel Chicago O’Hare in Rosemont, IL. The event will begin with a reception at 5:30 p.m. Cost for the event is $75 per person. For more information and how to register for the event visit, www.nama.org/amc/bon/region4.htm. This event will take place at the VooDoo Lounge at Harrah’s Casino & Hotel in North Kansas City, MO. The event will begin with cocktails at 6:00 p.m. Cost is $65 for the event. For more information and how to register visit, www.nama.org/amc/bon/region2.htm. What do people think of when they see or hear your name? How Powerful is Your Brand? Noted branding authority, Scott Deming, will lead you through the process of turning customers into loyal fanatics with every customer becoming a brand evangelist during the Second General Session at the 2007 Agri-Marketing Conference, April 11-13 in Dallas. Based on his new book, “The Brand Who Cried Wolf,” this presentation will break all boundaries of the typical customer service or brand building processes. Deming started his own marketing and advertising company-RCI in 1983, which eventually grew into a multi-million dollar organization servicing Fortune 500 companies and many other medium to large corporations across the country. Scott and his firm helped their clients successfully grow their businesses and beat their competition with what could be considered (by the conservative competition) as renegade branding, sales, customer service and communications programs. Not surprisingly, it was this very same progressive thinking that helped Scott’s firm realize uncommon growth and success over a twenty plus year period and achieve many awards, such as The Business Journal’s “Most Inspiring Business of the Year”. Unlike many agency and branding professionals, Deming knew early on in his career that great advertising alone was not going to build and sustain a powerful brand. Advertising was merely an awareness vehicle. If his clients were to truly grow their companies and create a powerful, emotional brand, they would do so by focusing more on relationships. Today, Deming is an internationally known consultant and speaker on creating the ultimate customer experience and turning each and every customer into an evangelist. His clients include such notable corporations as 3M, Carrier, Royal Caribbean, Kodak, Verizon Wireless, The Scotts Company and GlaxoSmithKline. He has been interviewed for his unique approach to brand building on national radio business programs such as Bloomberg Business, Small Business Advocate, and News You Can Use. He has also been quoted in national publications such as Financial Events Magazine, Newsweek, Executive Excellence, and Entrepreneur Magazine. Join us, Thursday, April 12 at 11:00 a.m., for a fast-paced, high energy journey through six critical steps to create the ultimate customer experience and build a powerful, emotional brand. For more information about this session and the Agri-Marketing Conference & Trade Show, please visit, www.nama.org/amc. To register for the 2007 Agri-Marketing Conference visit, www.nama.org/amc/register.html. Over 80 attendees braved temperatures in the negative numbers to celebrate the Best of Region 3 at the Marriott Courtyard in Moorhead, Minnesota. Hosted by the Northern Prairie chapter of NAMA, the event honored the best work of the North Central, Iowa, Cornbelt and Northern Prairie Chapters. 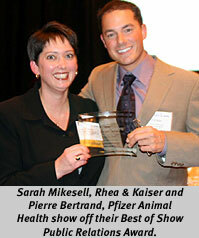 The region had 319 entries and the judging was held in Kansas City in November. Emcees, Roger Reierson, AdFarm and Cliff Meyer, Farm & Ranch Guide/MN Farm Guide, kept the group entertained and the show moving along. Colorado State University recently established a student NAMA chapter on its Fort Collins campus. 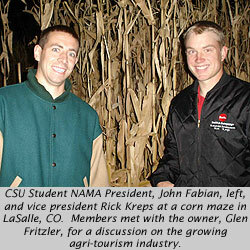 The NAMA chapter was developed under the CSU Agribusiness Association (ABA) and is funded by ABA and the CSU Department of Agriculture and Resource Economics. ABA was originally established following NAMA guidelines some years ago, and CSU is excited to reintroduce a NAMA student chapter to the campus. Members have the opportunity to join the agri-marketing team, participate on committees, go on ag-industry tours, learn from guest speakers, assist in community outreach programs and host an annual Rocky Mountain Oyster Fry! And with the addition of a student NAMA chapter, members have access to new and exciting networking and professional opportunities! Gateway NAMA kicked off the new year with “Implications for Agribusiness with an Updated Outlook of the U.S. Economy” on January 9 at the Sherton Westport Plaza in St. Louis. Over 60 people attended this meeting that was held in conjunction with the St. Louis AgriBusiness Club. Terry Barr, Chief Economist for the National Council of Farmer Cooperatives (NCFC) and Vice President of the Cooperative Business Center in the NCFC was the presenter for the event. Barr spoke about the outlook for the U.S. and global economy and the implications for agriculture and agribusiness. Included in his talk were factors shaping the rapid structural transformation of the U.S. and global food, fiber as well as agriculture business systems and the implications for farm policy, agriculture trade policy and rural infrastructure. Barr made a lot of forecasts that included potential doubling of ethanol production within 4 years and a doubling of how much corn is being used to make ethanol. 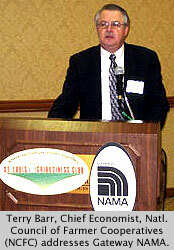 We are currently updating the Member Company Web Site page of the NAMA web site. Check to see if your company is listed and the web link is correct on the Member Company Web Site page at http://www.nama.org/links/links-index.html. If not, please complete the on-line form at http://www.nama.org/companylinks.htm to send your company’s link to NAMA to post on the web site.We appreciate your help! Don’t Miss the Best of NAMA! The regional and chapter Best of NAMA ceremonies are just around the corner. These ceremonies are celebrations of those entries that won first or merit in the regional competition that took place in November. This ceremony will take place in the Grand Ballroom at the Courtyard by Marriott in Moorhead, MN. The event begins with a reception at 5:30 p.m. Cost is $65. For more information on the event and how to register visit, www.nama.org/amc/bon/region3.htm. The Carolinas/Virginia NAMA chapter ceremony will take place at the North Carolina State Fairgrounds in the new Martin Building. For more information annd how to register for the event visit, www.nama.org/amc/bon/carvir.html. Entries that win first or merit at the regional competition and score above the minimum point standard are eligible to advance to the national competition in February. Winners of the national competition will be announced at the national Best of NAMA ceremony which kicks off the 2007 Agri-Marketing Conference & Trade Show, Think Big, April 11, in Dallas, Texas.